Mera peak climbing and Mera la trek is a challenging itinerary design for adventure trekkers. This adventure trip takes us to the summit of Mera Peak (6,461m/21,190 ft) which is the highest trekking peak in Nepal. We ascend Mera Peak preferably during the spring and autumn seasons as it’s the best time to climb the mountain for its astonishing views of the Himalayan Vista. Mera peak summit or mera la summit offers one of the breathtaking Himalaya view with five 8,000 m peaks visible including Mt. Everest (8848m), Cho-Oyu (8201m), Lhotse (8516m), Makalu (8463m), Kanchenjunga (8586m), Nuptse (7855m) and Chamlang (7319m) and many other snow-covered mountains. Moreover, you can see the tallest mountains, the high mountain villages, brilliant landscapes and some of the oldest Buddhist monasteries. It has a great opportunity to experience the local Sherpa hospitality. Along the routes, you can walk at your own pace, with plenty of stops for rest. Mera Peak Trek is possible with anti-clockwise also. Mera Peak trek combing with summit can be done in any time (except winter) throughout the year. A trek to Mera peak is compared to most walks in this region leading up to Mera peak summit. The particular route is designed for world explorer who wishes to hike to the high mountain summit but is with restricted in time-wise than let us know your own travel itinerary. But for travelers who wish to this trekking and climbing with a more relaxed manner than try this itinerary however if this itinerary is not ft you than send us an inquiry for tailormade itinerary. Day 02World heritage site of Kathmandu valley sightseeing, 7 hours. After breakfast the day will start to our guided trip to cultural world heritage sites in Kathmandu valley; including visits to the pilgrimage sites of Hindus Pashupatinath temple, the world biggest Bouddhanath Stupa, visit Swoyambhunath Stupa also known as monkey temple and historical Kathmandu Durbar Square with temple, unique architectures and Kumari (living goddess) in central Kathmandu . Evening pre-trip discussion and introduce with our fellow trekking staff for your adventure trip. Day 03 Fly to Lukla (2,804 m) trek to Chutok (2800 m) 3 hrs. An early morning start takes us to Tribhuwan international Airport in Kathmandu for the 35 minute scenic flight to Tenzing and Hillary Airport at Lukla at 2804m . On arrival at the airport our guide will brief you and introduce our porters before we begin our trek towards up to the Chutok La pass at 2945 m and over night at Chutok lodge. Day 04Trek – Col Khari La (3081 m) to Pangkongma (2950 m) 6 hrs. After the pass of Col Khari La the trail carries along mountain sides through the Khari Khola valley to set up camp in Pangkongma. Overnight at lodge. Day 05Trek to Kurke (3800m) 5 hrs. Another amazing day to walk via mountain crests through rocky mountain landscapes. Passing through splendid panorama of wooded regions below us. Overnight at lodge. Day 06Trek to Thuli Kharka (4200m) 6 hrs. Today we climb up to a pass at 4400m and descend towards Thuli Karkha, which mean “vast pasture”. Overnight at lodge. Day 07Trek to Khothey (3600 m) 5 hrs. We descend on hillsides, by pleasant meadows and lower down through forests of blue Himalayan pines and rhododendrons. Beautiful views of the south side of Mera Peak. Overnight at lodge. Day 08Trek to Tangnag (4350m ) 6 hrs. As we head to the west bank of the Hinku Khola northwards, forest blurs in and valley zooms out. We spot meadows being used as grazing areas for goats, sheep and yaks in the Upper Hinku. After several ascents for 4-6 hours, we approach summer settlement of Tangnag as we cross a single-plank bridge at Gondishung. We halt for lunch at this spot. Lying in its vicinity is 200-year-old gompa resting beneath a massive boulder and a number of crude mani walls. The trail offers an outstanding view of Peak 43. Overnight at lodge. Day 09 Acclimatization and Rest day at Tangnag. Spending a day here in order to acclimatize and adjust to the thinning of the air. Overnight at lodge. Day 10 Trek to Khare (4900m ) 4 hrs. We utilize two days getting completely acclimatized. After proper rest, we can explore other adventure possibilities like strolling by Sabal Tsho, a beautiful moraine-dammed lake which is hidden behind the Sabal Glacier and climbing a peak up to an altitude of nearly 5000m. We can also explore Hinku Nup Glacier, leads north toward Kangtaiga. The upper Hinku valley turns to the east at Tangnag, crossing the moraine of the Dig Glaciers. Overnight at lodge. Day 11 Trek to Mera La (5415m ) and Base Camp (5500m) 5 hrs. Progressing along the snowy glacier, we approach the pass the slope becomes steep. We use this day for acclimatization. After proper rest, we take a walk up to a small peak on the west side of the Hinku Nup Glacier, where we can reach a height of around 5500m. At this point, we get to capture stunning views of Mera La and Mera Peak. Overnight at tented camp. One of the best parts of the trek. Stunning panoramas of giant mountains rising above 7000m , among the highest on earth Chamlang (7290m ), Makalu (8475m ) and Baruntse (7220m) to the east, Everest (8848m), Lhotse (8501m ) and Nuptse to the north. Continuing westward the peaks of Ama Dablam, Cho Oyo (8153m) and Kantega fill our view. Overnight at tented camp. Day 13 Summit to Mera peak (6654m ) and then return to Khare (4900m ) 10 hrs. Start early in the morning depending on the weather condition. Overnight at tented camp. There is no such guarantee that we can get quite a favorable weather on our planned day for the summit. So this day is used as a contingency in case if we are unable to summit due to bad weather condition or some other reasons. If the weather gets exceptionally unfavorable we wisely have to postpone the program of the summit the peak. In case if someone gets some problems in acclimatizing well enough to make the ascent; the day can be used in that condition too. If the trip goes smoothly, we do not need this spare day. Day 16Trek to Thuli Kharka(4200 m) 6 hrs. Day 17 Trek to Lukla (2804 m) 7 hrs. How much does Mera peak climbing cost? The trip is available on USD 1,999 is standard trek price on double occupancy basis. But of course, the trip price will vary according to group size. For the deluxe and luxury trekking tour plan, we add 3-star category hotel deluxe air-conditioned room in Kathmandu (BB PLAN) and Tourist standard accommodation with attached bathroom while on trekking on possible places. AND WE ARE OPEN TO CUSTOMIZE YOUR TOUR AND PACKAGES PRICE AS PER YOUR REQUIREMENTS. International tour leaders are highly encouraged to get discount and attractive complimentary. 2 nights Twin sharing Tourist standard hotel accommodation in Kathmandu with breakfast plan. Professional Mountain (NMA REGISTERED GUIDES) Climbing Guide for Mera peak climbing (1 nights 2 days). Required number of porters during the trek. (one porter = two guest basis) because our porter can carry maximum 22 kg of your bag pack. Makalu Barun National Park entries permits their fees. Personal trekking and climbing equipment and Clothing. 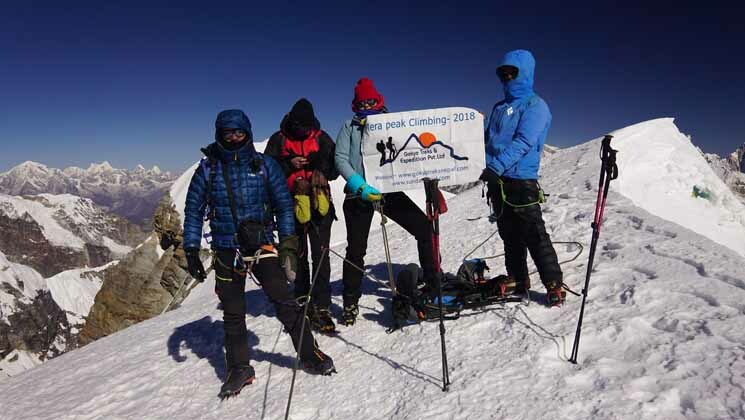 We can organize private trek to mera peak climbing starting at any date that works for you. Please contact us for more information. Question: Do I need experience for Mera peak climbing? Answer: It is suitable for experienced trekkers who can walk roughly about 4 or 5 hours in a day, with a lightweight daypack because as you are going to climbing island peak, you need to have experience in high altitude – somehow about 4,000 meters above sea level. Question: What kind of accommodation can I expect on mera peak express climbing? Answer: We provide you tourist standard accommodation in Kathmandu and during the trekking normal but the rooms are clean cozy bed with nice mattress and blankets. However we recommend you to take your own sleeping bags if you have one with you otherwise, you may rent it while you are in Kathmandu. Question: What kind of food can I expect in mera peak climbing and mera la trekking? The dinner and breakfast are provided in the same lodge you spend the night every day and Lunch will be provided on the way to the next place where you are going. However, for climbing days you will have climbing food hot drinks. Question: What opportunities will I have for a shower along Mera peak climbing and trek? Answer: Guest house trekking all the lodges they have a shower which you can get it on pay. Question: How do I get drinking water on lodge Mera peak climbing ? Answer: During the trekking route there are all places hotel and shops where you can able to buy mineral water and you can buy it for drinking but however we advise against buying mineral water in plastic bottles, as currently there are no provisions for disposing of these. We recommend you to bring chlorine tablets to purify the normal water as the normal water is available at the campsite along the way. Answer: During the guest house trekking there will be chances to charge a battery on pay. We recommend you bring an extra pair for in case. Remember to bring your adapters! And we recommend you to take extra batteries along with you. Question: Is there any communication facilities on Mera peak express climbing? Answer: In this trekking route you can get telephone services as well as internet services. Answer: No! So, for the trekking routes, you need to have cash Nepali rupees because credit cards work only in the bigger cities or in luxury hotels. And regarding the deposit, we prefer 20 % advance deposit of the total price of the trip in order to confirm your reservation before you arrive in Nepal. And rest of the payment can be made after your arrival in Kathmandu. Question: Who will carry my luggage on express Mera peak climbing? Question: Do I need walking polls for short Mera peak climbing? Question: Where can I organize my person climbing gears? Answer: If you have those climbing gears at your home then bring them along with you. If you don’t have them then you can rent it in Khahera village. Khahare is a base camp gateway to Mera peak, guest house, you can get all those gears for Mera peak on rent. Discover the best Himalayan view in 360 deg angle from Mera la summit. Challenging Mera summit offers the best scenery of all khumbu Himalayas. Sherpa Buddhism, ancient monastery, Local sherpa and their life styles. Opportunities for challenging trekking or hiking and pleasant strolls are scattered all over this planet; you just need to know where to find them. We at Gokyo Treks and Expedition believe in the quality services. Your safety and satisfaction is our concern. We are a team of professional, experienced, well trained and licensed local guides who know the destination much better than others. Not only this but also we give benefits to the local communities and helps to conserve natural resources which reduced in costs and consumption. We had pleasure to use services of Gokyo Treks & Expeditions during our tour. It was 19 days in mountains, trekking and Mera Peak and Amphu Lapcha Pass climbing. Services were professional, stuff was really helpful and friendly. During our trip there was good communication with Ammar, so we could be sure that someone is escorting us. I can highly recommend this agency and will use their services again for sure.